Thanks for putting this very Scandinavian word in the course! The moose is considered the national animal of Sweden. We have lots of them (300,000-400,000 in the summer) and when I just googled this, I found an article that said that Sweden and Norway have the highest "moose density" in the world (twice as many moose per hectare of forest even than in Finland, which comes second, and in turn has twice the density that Canada has). Moose are very noticeable animals, they're a serious danger when driving in the countryside, and hunting them is a big deal in some circles. A big deal as in frowned upon or as in highly regarded? As in they're coveted by hunters, and the whole getting together and spending time in the forest thing is important culturally to a lot of Swedes as well. But of course, there are others who advocate against hunting anywhere, including Sweden. Surely it wasn't an elk. Moose have bigger snouts, and bigger ears, and maybe bigger eyes...and teeth! Oh my, those teeth!! Are you sure it wasn't en varg? Was your sister wearing a red, hooded cape when the "moose" bit her? Seriously, moose and elk are different. I'm looking forward to learning the Swedish words that distinguish the pair. Moose bites can be quite nasty, you know. Another Monty Python reference isn't it? why is it that EVERY COMMENT about älg seems to be about the distinction between moose and elk, and nobody cares that the pronunciation sounds more like äli and no g to speak of? what's the deal with that? is there something regular about it? can someone clue me in? the distinction between moose and elk is irrelevant to an Australian lol...... we don't have either. Your question is actually answered in this thread :). I repeat: It's like a Swedish "j" (or English "y"). That happens to "g" after "l" (älg) and after "r" (berg - mountain). Alces alces or "älg" in Swedish are elk in Europe for the same reason they are "moose" in the USA: because that's the English version of what the locals called them. "Elk" is an anglicization of "älg" and "moose" is an anglicization of the north american native (esp. Algonquin) word. In America both USA moose and USA elk were once (18thC) frequently called moose by Americans (grey moose as opposed to black moose)! Eventually it became the accepted convention to borrow the brit word "elk" to describe the wapiti (Cervus canadensis.). Wapiti is the native american name for this creature and is also acceptable as its English-language name. So when an English-speaking person in Europe once pointed to an Alces alces and said "what is that? ", he recived an answer from Germanic locals that sounded like "elk". So he called it an elk. When an English-speaking person in north american pointed at Alces alces and said "what is that? ", he recived an answer from the locals (speaking some flavor Algonquin) that sounded like "moose". Without many picture books, naturalists or the Internet to point out this conflict of names, the 2 names for 1 creature have caused confusion ever since. "Moose" and "Elk" in the USA are two completely different animals, thus the initial question. They are indeed. USA "moose" being Alces alces (and "älg" in Swedish), while a USA "elk" (or wapiti) is Cervus canadensis. The wapiti does not exist in Europe, although it looks a bit like a red deer, which is found in Europe (but not Sweden). Yes. Also see freymuth's reply above. I understand moose and elk to be separate and distinct animals. The definition choices for "alg" list boht moose and elk. Would someone be so kind as to clarify if this word is specific to one animal or if it truly means either moose or elk such as "just a large member of the deer family". According to this link älg refers to the flat-antlered alces alces (which is called moose in North America). If a North American says elk, he or she is referring to cervus canadensis. We've removed the hint elk since it was confusing to users, but the reason it was there before was that the animal in question is called that in British English. So elk is still an accepted answer throughout the course. Am I right in thinking that the "g" in "alg" is not enunciated? It's like a Swedish "j" (or English "y"). That happens to "g" after "l" (älg) and after "r" (berg - mountain). Why is elk not used instead of moose? They are the same animal but I thought the European word was elk. Quite. In British (that is to say, European) English, the word "elk" refers to the Eurasian animal Alces alces, while "moose" refers to the North American creature Cervus canadensis. 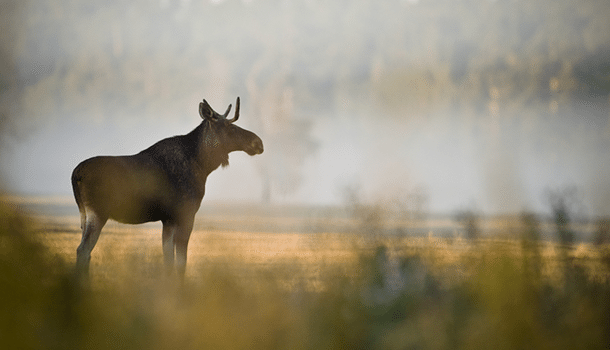 There being no North American moose in Sweden, "älg" = "elk". I guessed because it hadnt come up yet, I said "an elk" and it corrected me to "1 elk" but now this thread says its moose...so I'm a tad confused! Okay so I got that the g is pronounced somewhat like a "y" before "soft" vowels (someone linked to an article explaining that), like in "älgen", but why is it still pronounced like that even when there is nothing behind it? Is it the same word for the mouse on the computer? We use mus for both, yes, and specify datormus if needed - literally "computer mouse". But this word is not mouse, it's moose.